As one of the Energy Experts in home energy efficiency, you are called on to make recommendations on weatherization, improved insulation, air sealing, and duct sealing. But your clients also expect you to know about heating systems and their cost and performance so you need to know about the relative performance of not only conventional heating systems, but newer technologies like ductless heat pumps and electric infrared radiant panels. At Ducoterra, we analyzed the heating performance characteristics of the most common heating systems on the market today. 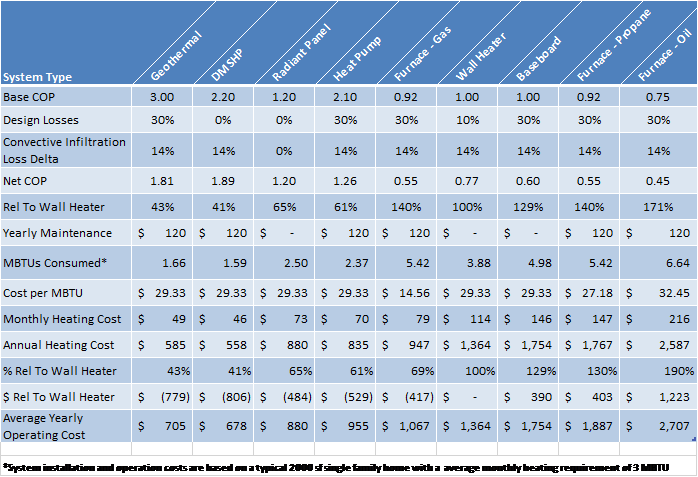 The results on this analysis shows that ductless heat pumps and infrared radiant heating panels are the two most cost effective heating systems available today. Here are the results based on a typical 2,000 sf single family home with an average monthly heating requirement of 3 MBTU. While wall and baseboard heaters are inexpensive to purchase and install, they have hidden costs. SolaRay infrared heating panels are 35% to 50% more efficient than wall or baseboard heaters, using far less electricity to provide the same level of thermal comfort. The reason is simple. Baseboard and wall heaters take 7.5 watts per square foot to heat a room, while SolaRay radiant panels only need 5 watts per foot. Plus, there are no thermal losses from convection with radiant panels. These factors and others combine to give SolaRay panels their greater efficiency. In addition, SolaRay heaters deliver a comfortable, gentle, sun-like heat that eliminates cold spots and drafts. In just over 3 years a SolaRay heater will pay for itself compared to a baseboard heater and in just 7 years compared to a wall heater. Not only that, but over a 30-year life of a home, homeowners would have to replace the wall or baseboard heaters at least 3 times due to their limited lifetime. And often at the worst time, they can burn out in the middle of winter requiring expensive replacement. Ducoterra’s SolaRay infrared heating panels also can work hand-in-hand with other systems, like ductless heat pumps, to create a more cost effective heating system while maintaining a high standard of comfort and energy efficiency. As you can see from the tables above, SolaRay infrared heating panels are one of the least costly systems to install, other than inefficient baseboard or wall heaters, and are nearly as efficient as geothermal or ductless systems. 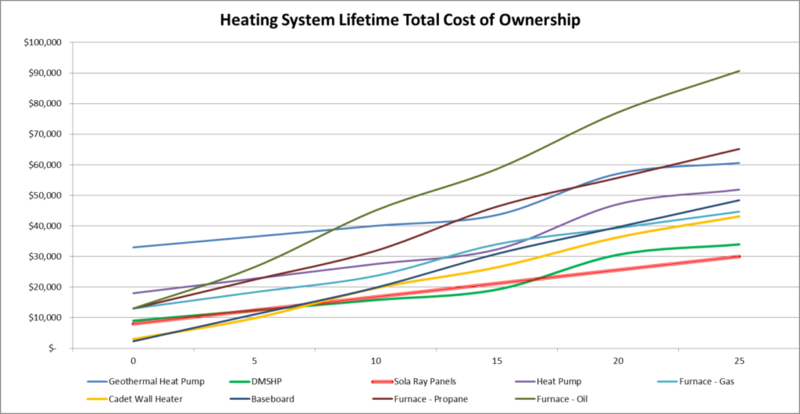 But the most important factor is Total Cost of Ownership (TCO) – what is a heating system going to cost a customer over 10, 20, or 30 years? When you consider all the costs associated with a heating system – install costs, operating costs, maintenance costs, repairs, and replacement costs for failed heaters, SolaRay infrared heating panels are the clear leader with ductless heat pumps close behind. And with all panels backed by our 20-year warranty, that means guaranteed savings.